One of the things I love about writing for Mooney on Theatre is that I often get to learn about new venues, new companies, or new parts of the city. The Civic Light–Opera Company is a community theatre group based in the northeast end of the city. Their production of Brigadoon at the Zion Cultural Centre allowed me to do all three. Overall, I thought the company delivered a fine performance. It was fun to revisit an old favourite in a new (to me) setting. Brigadoon is a classic musical from the 1940’s with a familiar plot and familiar tunes. The play tells the story of two American tourists who get lost while hiking in the Scottish highlands. They wander into Brigadoon, a mysterious village which appears for only one day every 100 years. One of them falls in love with Fiona, a local lass and must decide whether to stay with her or return to New York. This production sticks to a traditional interpretation, with a few modern references. The set is simple and painted with colourful flowers and leaves. The tourists wear modern dress and carry backpacks. The villagers wear long dresses and tartan kilts. Everyone speaks or tries to speak with a Scottish accent. That part didn’t work so well for me. I realize accents can be hard but my personal preference is to not do it if you can’t do it well. I find it makes the dialogue hard to hear and understand. My favourite performer was Mickey Brown, as Meg Brockie, the flirtatious milkmaid who is “working up” to marriage by seducing a series of men. David Haines’ performance as Jeff Douglas, the often drunk and wisecracking sidekick was also a highlight. Their interactions, as Meg leads him into a shack in the forest, were over the top and very funny. Caroline Moro-Dalicandro was great as Fiona, the romantic lead. She had a lovely voice and was both sweet and strong as she falls in love with Tommy Douglas. Some parts of Brigadoon did feel a bit dated to me. There are stereotypical references to men needing to lay down the law for their wives and jokes about Scots being tight with money. But, in the end, it is a feel-good romantic comedy with lovely and memorable songs which leaves you feeling warm and fuzzy and believing in the power of love. I’ve been humming ever since. Shows are at 7pm on Wednesday, 8pm Thursday – Saturday, with 2pm matinees on Saturday and Sunday. Tickets are $28 and can be purchased online or by calling 416-755-1717. 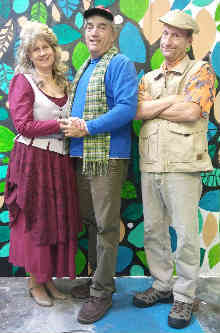 Photo of Caroline Moro-Dalicandro, Joe Cascone, and David Haines provided by the company.